Analytics in Azure is up to 14x faster and costs 94% less than other cloud providers. Why go anywhere else? It’s true. With the volume and complexity of data rapidly increasing, performance and security are critical requirements for analytics. But not all analytics services are built equal. And not all cloud storage is built for analytics. Only Azure provides the most comprehensive set of analytics services from data ingestion to storage to data warehousing to machine learning and BI. Each of these services have been finely tuned to provide industry leading performance, security and ease of use, at unmatched value. In short, Azure has you covered. When it comes to analytics, price-performance is key. 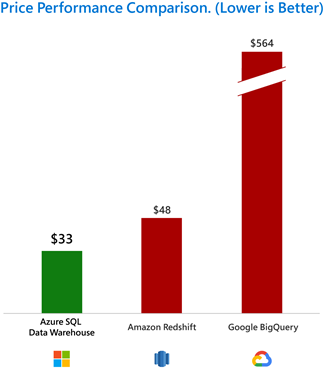 In July 2018, GigaOm published a study that showed that Azure SQL Data Warehouse was 67 percent faster and 23 percent cheaper than Amazon Web Service RedShift. That was then. Today, we’re even better! 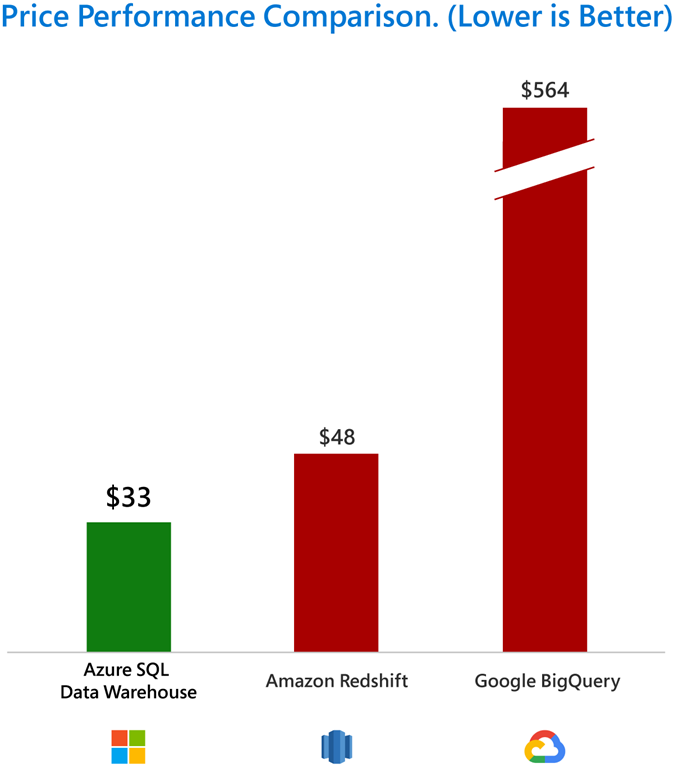 In the most recent study by GigaOm, they found that Azure SQL Data Warehouse is now outperforming the competition up to a whopping 14x times. No one else has produced independent, industry-accepted benchmarks like these. Not AWS Redshift or Google BigQuery. And the best part? Azure is up to 94 percent cheaper. This industry leading price-performance extends to the rest of our analytics stack. This includes Azure Data Lake Storage, our cloud data storage service, and Azure Databricks, our big data processing service. Customers like Newell Brands – worldwide marketer of consumer and commercial products such as Rubbermaid, Mr. Coffee and Oster – recently moved their workload to Azure and realized significant improvements. All the price-performance in the world means nothing without security. Make the comparison and you will see Azure is the most trusted cloud in the market. Azure has the most comprehensive set of compliance offerings, including more certifications than any other cloud vendor combined with advanced identity governance and access management with Active Directory integration. For analytics, we have developed additional capabilities to meet customers’ most stringent security requirements. Azure Data Lake Storage provides multi-layered security including POSIX compliant file and folder permissions and at-rest encryption. Similarly, Azure SQL Data Warehouse utilizes machine learning to provide the most comprehensive set of security capabilities across data protection, access control, authentication, network security, and automatic threat detection. What’s the best compliment to Azure Analytics’ unmatched price-performance and security? The answer is Microsoft Power BI. Power BI’s ease of use enables everyone in your organization to benefit from our analytics stack. Employees can get their insights in seconds from all enterprise data stored in Azure. And without limitations on concurrency, Power BI can be used across teams to create the most beautiful visualizations that deliver powerful insights. Leveraging Microsoft’s Common Data Model, Power BI users can easily access and analyze enterprise data using a common data schema without needing complex data transformation. Customers looking for petabyte-scale analytics can leverage Power BI Aggregations with Azure SQL Data Warehouse for rapid query. Better yet, Power BI users can easily apply sophisticated AI models built with Azure. Powerful insights easily accessible to all. We continue to focus on making Azure the best place for your data and analytics. Our priority is to meet your needs for today and tomorrow. General availability of Azure Data Lake Storage: The first cloud storage that combines the best of hierarchical files system and blob storage. General availability of Azure Data Explorer: A fast, fully managed service that simplifies ad hoc and interactive analysis over telemetry, time-series, and log data. This service, powering other Azure services like Log Analytics, App Insights, Time Series Insights, is useful to query streaming data to identify trends, detect anomalies, and diagnose problems. Preview of new Mapping Data Flow capability in Azure Data Factory: Visual Flow provides a visual, zero-code experience to help data engineers to easily build data transformations. This complements the Azure Data Factory’s code-first experience to enable data engineers of all skill levels to collaborate and build powerful hybrid data transformation pipelines. Azure provides the most comprehensive platform for analytics. With these updates, Azure solidifies its leadership in analytics. Watch this space. There’s more to come! To learn more about how Azure provides the best price-performance, get started today.